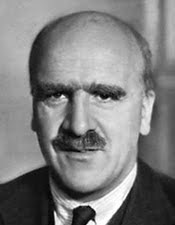 Haldane (Nov. 5, 1892 - Dec. 1, 1964) is best remembered along with E. B. Ford and R. A. Fisher one of the three major figures to develop the mathematical theory of population genetics. His greatest contribution was in a series of ten papers on "A Mathematical Theory of Natural and Artificial Selection" which was the major series of papers on the mathematical theory of natural selection. It treated many major cases for the first time, showing the direction and rates of changes of gene frequencies. It also pioneered in investigating the interaction of natural selection with mutation and with migration. Haldane's book, The Causes of Evolution (1932), summarized these results, especially in its extensive appendix. This body of work was a component of what came to be known as the "modern evolutionary synthesis", re-establishing natural selection as the premier mechanism of evolution by explaining it in terms of the mathematical consequences of Mendelian genetics. From Wikipedia. More info here.